Clay Flaherty, Rural Action’s Media VISTA completed his year of AmeriCorps*VISTA service this month. Clay fulfilled a vital role as part of the Development and Communications team. 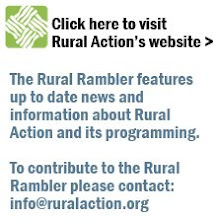 He was in charge of the content for all of Rural Action’s publications, including the Rural Rambler, our E-newsletter and our print newsletter, the Rural Report. A graduate of Ohio University’s Honor’s Tutorial College and E.W. Scripps School of Journalism, Clay celebrated the completion of his service by vacationing with his family in Spain. He is currently job hunting in the field of journalism and considering relocating to the Chicago area. We, at Rural Action, wish him the best of luck with his future plans.